Text is taken from the chorus of “Die Wacht am Rhein” (The Watch on the Rhine), a German patriotic anthem, written in 1840 by Max Schneckenburger and set to music in 1854 by Karl Wilhelm. 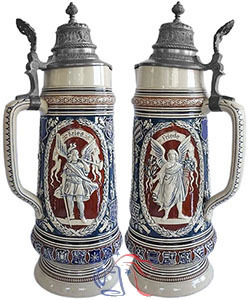 The central image is Germania, an ancient symbol personifying the strength, unity and liberty of Germanic peoples. The depiction here is taken from the Niederwalddenkmal, a monument erected near Rudesheim on the Rhine River following the Franco-Prussian War in commemoration of the founding of the German Empire. Side images depict Krieg and Friede, personifications of war and peace, respectively. Master stein to No. 1204.